CHOWING down on local produce is a right of passage for politicians visiting key electorates - but one wrong move can leave them with more than egg on their face. 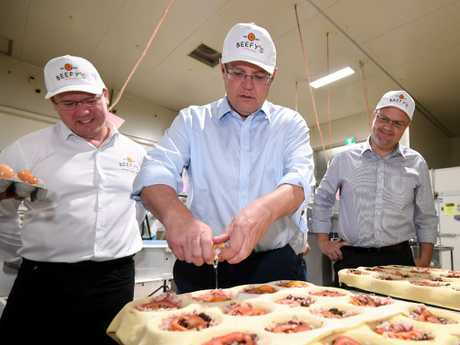 Prime Minister Scott Morrison took up the challenge with vigour yesterday, tearing into the signature dish at Beefy's Pies near Maroochydore during his tour of marginal seats in Queensland. The pastry crumbled, and Mr Morrison had to wipe his face clean, but he pulled off the challenge with a smile - and not even a drop of gravy on his shirt. But for every time a leader has passed the taste test there's an example of a food fail than ran the risk of turning voters' stomachs. In 2015, then-PM Tony Abbott casually munched on a raw onion on a visit to a farm - and the eye-watering footage was aired around the world. 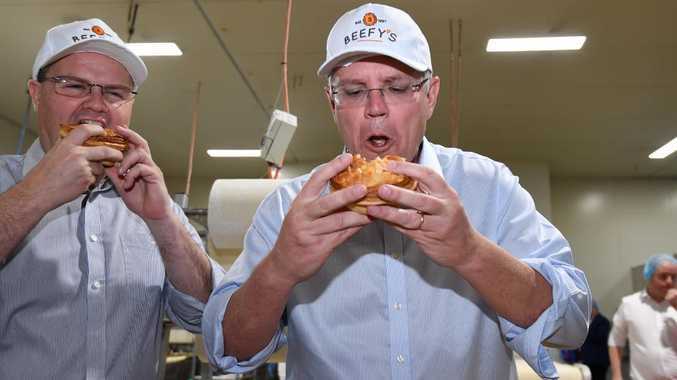 Opposition Leader Bill Shorten confounded logic and the Australian public in 2016 when he attacked a sausage in a roll - by starting in the middle. Malcolm Turnbull and Kevin Rudd are other PMs who dabbled in questionable eating techniques, before losing their job. Image consultant Annalisa Armitage said the food test was all about looking like an "average bloke" and the biggest challenge was appearing genuine because Aussies were very good at "smelling a rat".